Ok – so life has taken a turn – and who am I to be surprised, as a Libran with Saturn now firmly planted on my scales? No more City News – but instead a chance to rocket onwards towards that happy destiny of creative fulfilment. The next step is in place. I am now officially sending out a Daily Astrology Weather Report via Twitter and Facebook. If you want a little one-liner to travel with you as a friend through your day then please either follow me on Twitter. 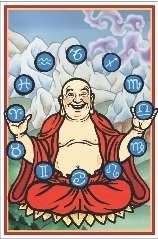 @SudhirAstrology is my moniker there – or befriend me on Facebook. Sudhir Daily Astro is my Facebook address. I look forward to getting some momentum going with this. I did my first one today and it was a buzz. The beauty of Twitter is the smallness of the posts. 140 Characters is a wonderful limit to put on. It’s like writing Haiku’s. To say something substantial in such a small space means one has to find what’s essential, or fall on one’s face. I really hope lots of people jump in, pass comment, tell tiny tales – whatever. It has taken nearly a fortnight of frigging around to get going with all this. It’s such a blast to be finally up and running. Upasana, who edited my book, has been a shining light on the Facebook front. This WordPress blog will keep pottering along as it has been. There will be no changes here. Hopefully I will soon come up with a system to make it easier for people to buy my book. I’m looking for a reliable on-line shopfront to link in with somewhere. I’ll keep you posted. In the meantime my book is available from many good bookshops in Australia and New Zealand, at www.boolarongpress.com.au or directly from me astropoetica@gmail.com I’m also firing on all cylinders on the Astrology Session front. Contact me if you want one. In person in Brisbane – or on MP3 elsewhere. Boolarong Press have had me go out to libraries and give talks about astrology and my book. So far I have done two. I look forward to doing many more. I love rabbit-ing on it seems – and people seem to enjoy discovering a whole new angle on astrology. If you want one – contact Boolarong or me. The more the merrier.